I work with a delightful gentleman called Giancarlo Russo, who is actually more a scholar than just a supplier of fine cheese. He is based in Tuscany but finds wonderful specimens in Umbria, Perugia, Sardinia as well as his Tuscan region. He is naturally curious and wants to learn more about the cheeses and who makes them, and we have long conversations and emails, as well as enjoying his brief visits to the shop to give talks about the cheeses at our special tasting evenings. One cheese has always intrigued me, and also Giancarlo, and it is the Fossa. It is a difficult cheese to get right and takes a special kind of mad scientist cheesemaker to induce the flavour profile. The curds are formed during the Spring months and left to ripen until mid-August, and then the special ageing process lasts until mid-November, when traditionally it is ready for the great feast day of St Catherine of Alexandria on November 25th. So its best eating timeframe for the younger cheeses is December through until March, which is perfect for several of the most important religious festivals in the calendar – Christmas, Epiphany and Easter. What better way to bring a fervour to these celebrations than a cheese that has undergone such a transformation process! If you keep them longer – say up to one year – you will be eating an extremely pungent and powerful tasting morsel which could bring tears to your eyes and a sharp catch to your throat. The cheeses weigh around 3kg and are made from pure ewe’s milk with an occasional addition of a little cow’s milk. The traditional Sopravissana and Sardinian hardy breeds of sheep are perfect for the milk, but I must now start at the beginning to let you into the world of Formaggio di Fossa. 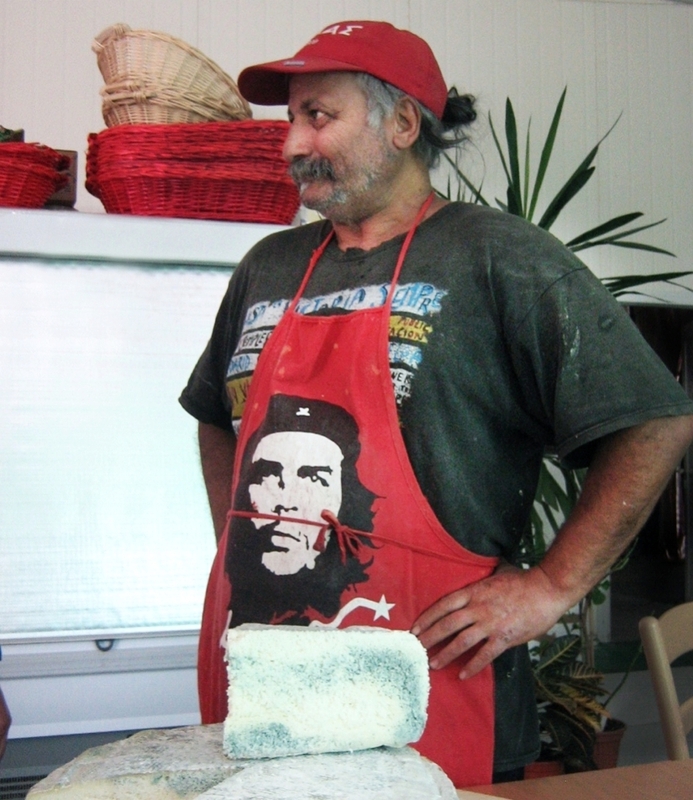 Walter is the cheesemaker; a shepherd and poet with a romantic idealism – Che Guevera is his idol – I expect he muses that all men should be free spirits much as women feel about Gloria Steinem and feminism. For over thirty years he has been based in the Monte Cucco park in the Appenines, close to the town of Gubbio to the north of the territory. The rivers Sentino and Chiascio flow through the hills and the population living and working in the park does not reach even 7,000. This is a protected mountain area exclusively of forest and pasture management and the lower valley area is used for cultivation at a very small level. The tufa rock houses subterranean waters and mineral springs; uncontaminated watercourses feed the big beech woods and the karst caves where tourists have guided visits. This unspoilt area remains in tact with historical sites and culture and hidden-away hermitages of the Benedictine order. All cheesemakers have their own style, as individual as a thumbprint I often say, and Walter’s style is very special, including the rennet (coagulant) he prepares made from pure goat, which lends a stronger and more untamed flavour to his cheese. The tradition of the Fossa means matured in pits (infossato) and dates back to the Etruscan period. Over centuries pits have been replaced by manmade chambers in the larger production dairies – or even in wooden barrels – but Walter has devised his own ferments to line his chamber. He uses a mixture of flora – 12 in number, including Bay, Rosemary, Wild Thyme and Fennel, Mint, Dandelion, Gentian and Beech twigs and leaves which he steeps in water, and then uses the liquid to moisten the ‘carpet of forest matter’ lining the pit carved out of the rock. Placing cheeses into cotton sacks. But before the cheeses are plunged into the pit they must be worked on to encourage the rinds and white noble moulds to grow. This takes place within the first three months of maturation. After that the cheeses are rubbed with the cocktail of flora and warmed for three days at 30-degrees-celsius in a special room. They are then moved to a cool chamber for forty days. This activation and slowing down encourages bacterial growth to stimulate the cheese. After forty days in the cool they are ready for the pit. In preparation groups of two or three cheeses are placed in cotton sacks measuring 70 x 40cm and placed in the Fossa, one piled on top of another, tightly packed and then covered with more vegetable matter. They will be left there for three months. The atmospheric conditions within the chamber and the sacks will give the live cultures in the curds (which have not been pasteurised) to grow and together with the goat rennet will give the cheeses myriad unique flavours and also create the cheese’s crumbly texture. The aroma emanating from the Fossa is strong, spicy and vegetal, not dissimilar to being immersed in a forest thicket. In the past this way of preserving cheese was to hide them from thieves as well as protect them from animal predators. Walter works his Fossa all the year round, cleansing it annually with a controlled burn. He matures other cheeses in grape and cherry must, also making a simple-style farmhouse Pecorino. When they are finally released from their chamber the fossa cheeses are not uniform in shape, and while I try to get the ones placed in the middle of the pile (these are the ones less likely to be too lopsided – they also have a much more even infusion of the essences of the pit) it is sometimes also good to have ones on the bottom and from the top as the flavours will be so different. When the cheeses arrive at our shop their aroma is almost overpowering, but settles once they acclimatise to our Cheese Room's even temperature and humidity. Once we cut into the cheese our tastebuds are attacked on all sides with an extraordinary array of complex fruity, aromatic, sapid and persistent flavours. This is not just a cheese but a whole host of flavours picked up from the forest floor, the caves, the underground streams and the atmospheric conditions throughout the day and night. These are flavours that take in time, place and the engagement of the milk. Whether tasted young or aged it will be an enjoyable experience to savour with a well-structured red wine such as a full-bodied Brunello di Montalcino or, with its tight tannins opening up to mellow roundness, a Rosso Riserva from Chianti. My favourite time of year to eat this cheese is often over the New Year, when I open a special bottle of wine saved for such an occasion and let it breathe for several hours. I cut slivers of Fossa, a crusty slice of Pagnotta bread and fill a beautiful bulbous glass with my chosen tipple. Cheese and wine are friends to the lonely, those who wish to be alone or wish to be left to contemplate and reflect, and one like Fossa is best eaten on its own as a stand-alone cheese.